It’s official. My favorite tool is the vice grip. 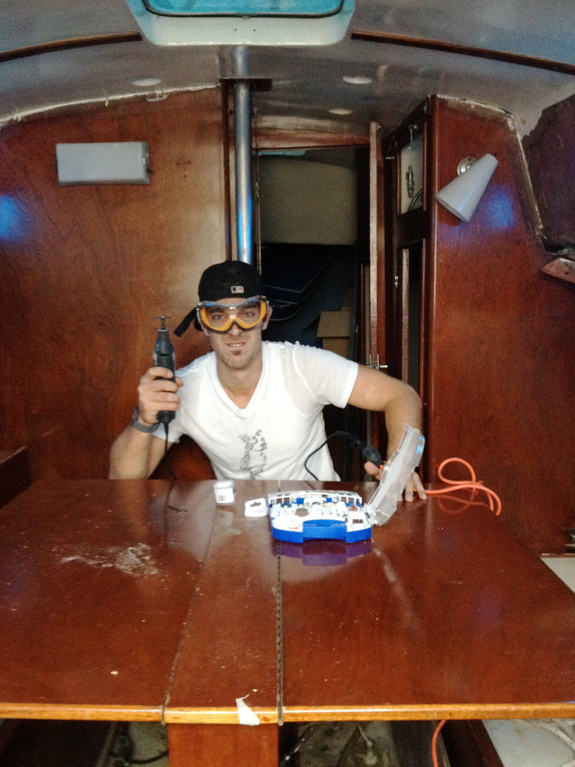 Those bad boys do everything – especially on an old boat that is full of rusted nuts, bolts, and screws. They saved the day on each and every project we completed this weekend. Well, the pliers paired with my sheer brilliance and ability to accurately assess spatial relations (Jason obviously had nothing to do with it). This past weekend was the first time I’ve been up at the boat since March! To say I was anxious to get up there and start working is an understatement. I wanted to get my feet wet and my hands dirty (both of which happened!). The last few times I was up there we were just removing all the hardware to prepare the deck to be refinished. You could easily spend an entire weekend removing 8 corroded screws from hard to reach spots. It felt great to actually get some things crossed off our Never Ending To-Do List. 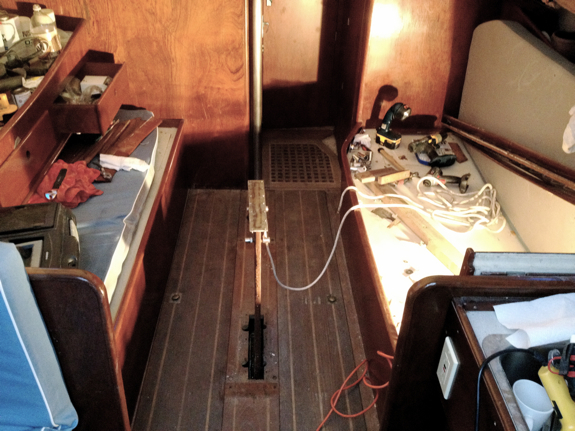 The first thing we tackled was removing the folding table that was covering the centerboard rigging. The table was really quite large – about 3 feet long and 9 inches wide, collapsed – and directly in the middle of our boat. With two dogs on board it was imperative that we give them a bit more space to move around. Actually removing the table was more of a puzzle than physical labor. 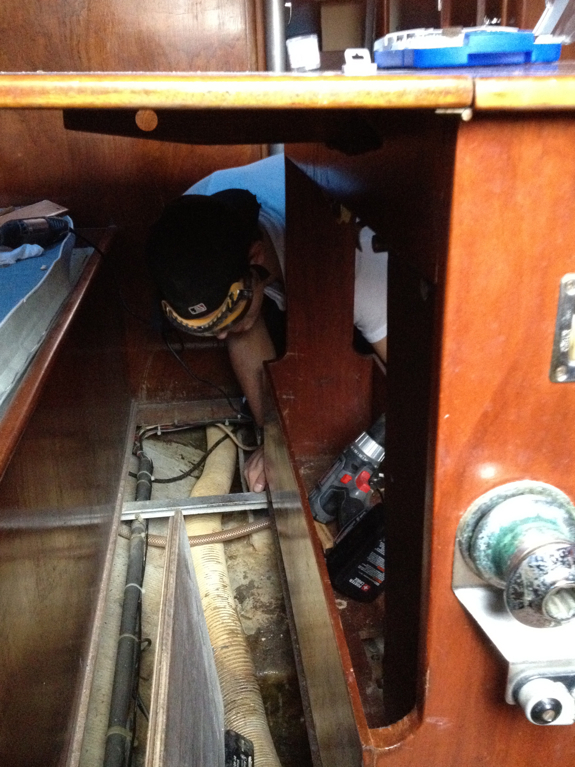 In the end we had to remove the bilge floor boards to access the bolts (see image above). We ended up removing bolts from the side, top and bottom before we could lift the intact table up and out of our living space. Most of the bolts were removed with a combination of our drills, vice grips and a large flat head screw driver. There were a few tough ones that Jason had to use the Dremel to cut through. Based on this picture, I think the Dremel may be one of Jason’s favorite tools. Here you can see the table fully extended and taking up way too much space. We’re really happy with how much space we have now that the table is out. Next up is to research if we can refit the centerboard rigging so we can fully open up the center space. Here’s the after view.